Detailed reports about your computer's connected power sources. Is there a better alternative to Battery Report? Is Battery Report really the best app in System category? Will Battery Report work good on macOS 10.13.4? Battery Report creates detailed reports about your computer and any connected power sources. Power sources include power adapters that connect your Mac to the mains power, internal batteries such as laptop batteries, and uninterruptible power supplies. Battery Report reveals information about your power sources that is not commonly available. This information includes power adapter's unique serial numbers, and the health of your internal laptop battery. Note: Now requires OS X 10.9 or later. Updated report style for OS X 10.11. Updated requirements to OS X 10.9 or later. Updated document links from HTTP to HTTPS. Battery Report needs a rating. Be the first to rate this app and get the discussion started! 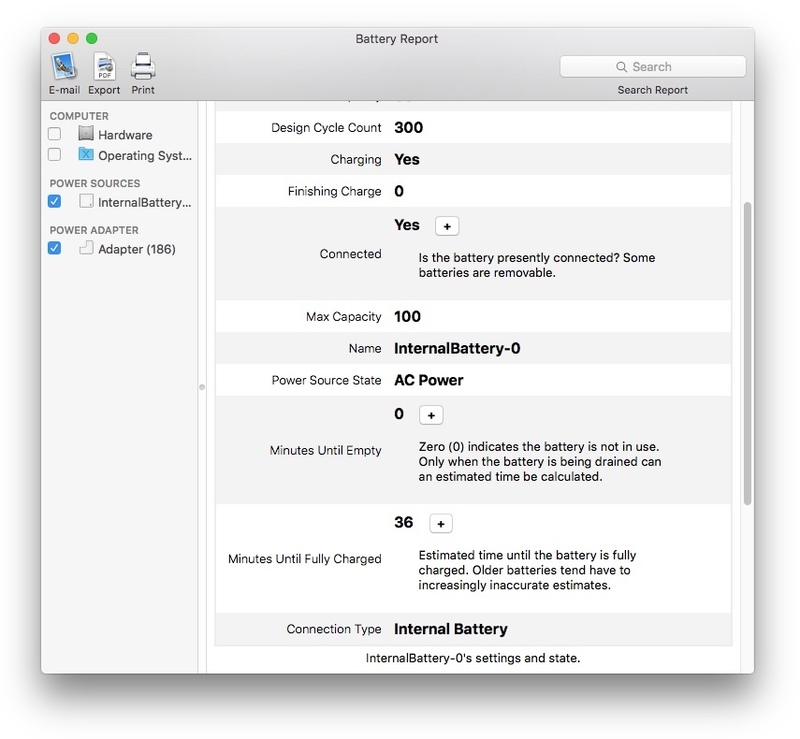 The information available in Battery Report's report varies depending on your Mac and your power sources. Modern batteries tend to include more information about their condition and state. Older batteries will still appear but may not display as much detail. 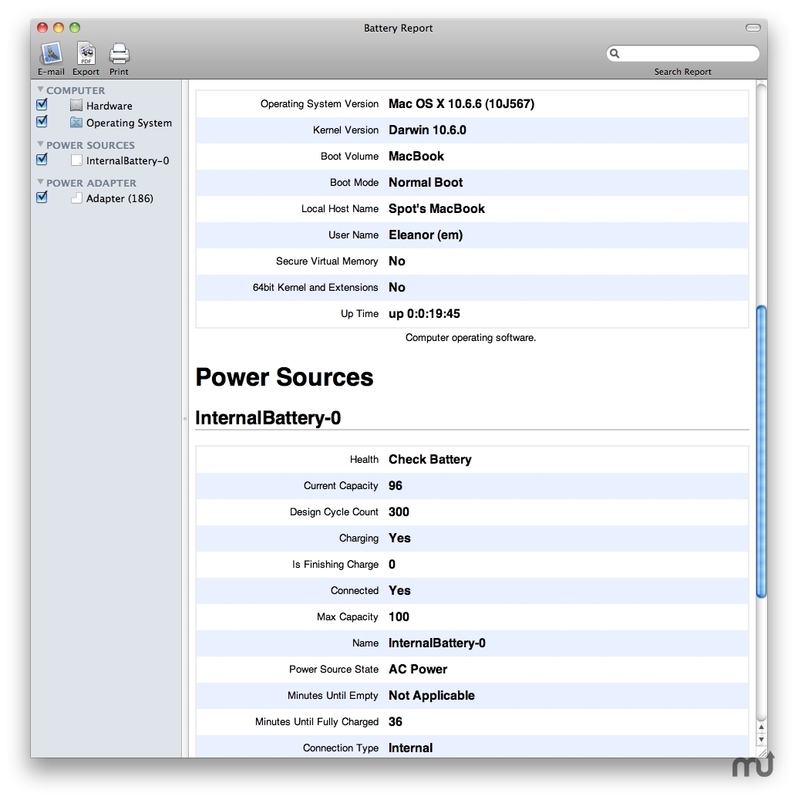 Battery Report includes information about all power sources available to your Mac. For uninterruptible power supplies (UPS) devices, this includes devices connected by a serial cable, USB cable, or over the network. If your UPS is supported by Mac OS X, it will appear in the report.